Between 1887 and 1896 Jewish immigrants from Europe from the First Aliya settled north of Jaffa building the Neve Tzedek neighborhood which was the beginning of modern-day Tel Aviv. 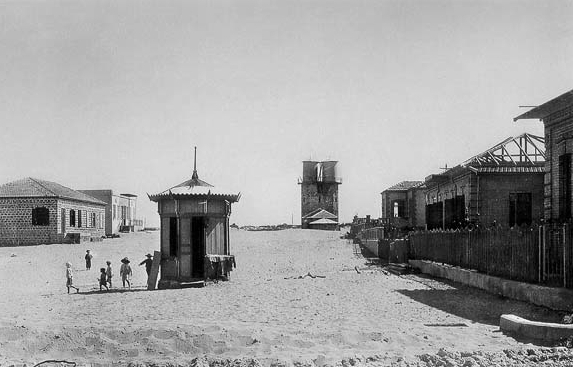 In 1906, on the initiative of Akiva Arye Weiss a group of Jews from the Second Aliya and residents of Jaffa got together to plan another neighborhood. To circumvent the Turkish prohibition on Jewish land acquisition, Jacobus Kann, a Dutch citizen and banker, helped to finance the purchase and registered it in his name. Kann perished during World War II in the Nazi concentration camp of Theresienstadt. 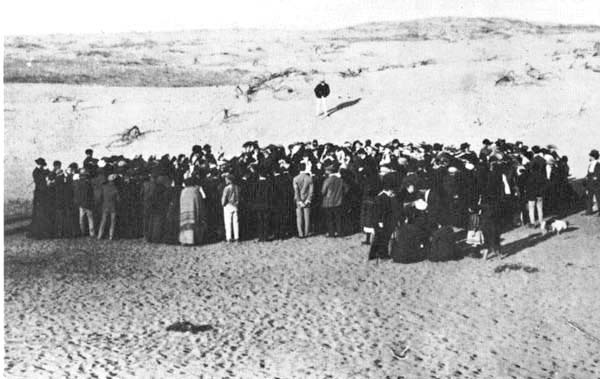 In the spring of 1909 sixty-six Jewish families took possession of building parcels by lottery and erected the first buildings among the sand dunes, vineyards, and orchards in Kerem Djebali along the coast north of Jaffa. There they established a “garden suburb” called Ahuzat Bayit (“Homestead”) which was shortly thereafter renamed Tel Aviv. The name Tel Aviv is from Sokolow’s translation of the title of Theodor Herzl’s Altneuland (“Old New Land”) based on the name of a Mesopotamian site mentioned in Ezekiel 3:15: “Then I came to them of the captivity at Tel Abib, that lived by the river Chebar”. It embraced the idea of a renaissance in the ancient Jewish homeland. Aviv is Hebrew for “spring”, symbolizing renewal, and Tel is a mound made up of the accumulation of layers of civilization built one over the other symbolizing the ancient. 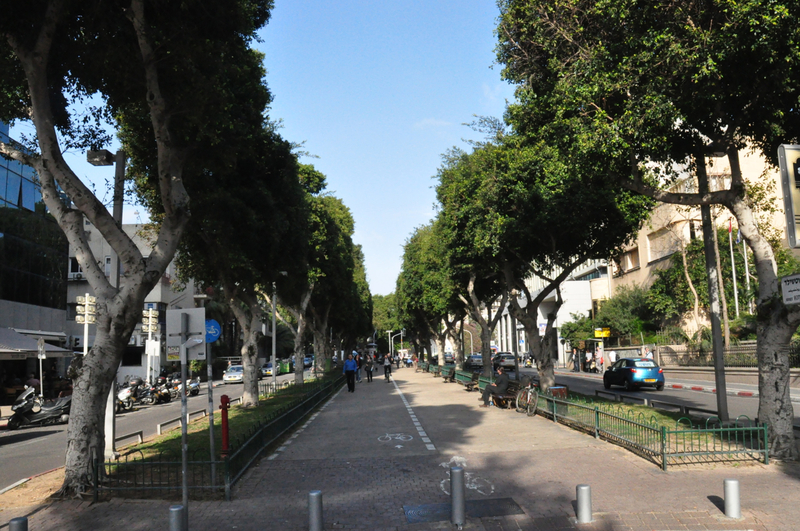 Walking along one of the first streets of Tel Aviv, leafy Rothschild Boulevard (did you know that the street was originally named Ha’am Street? ), is like visiting a historical museum that lines both sides of the street. 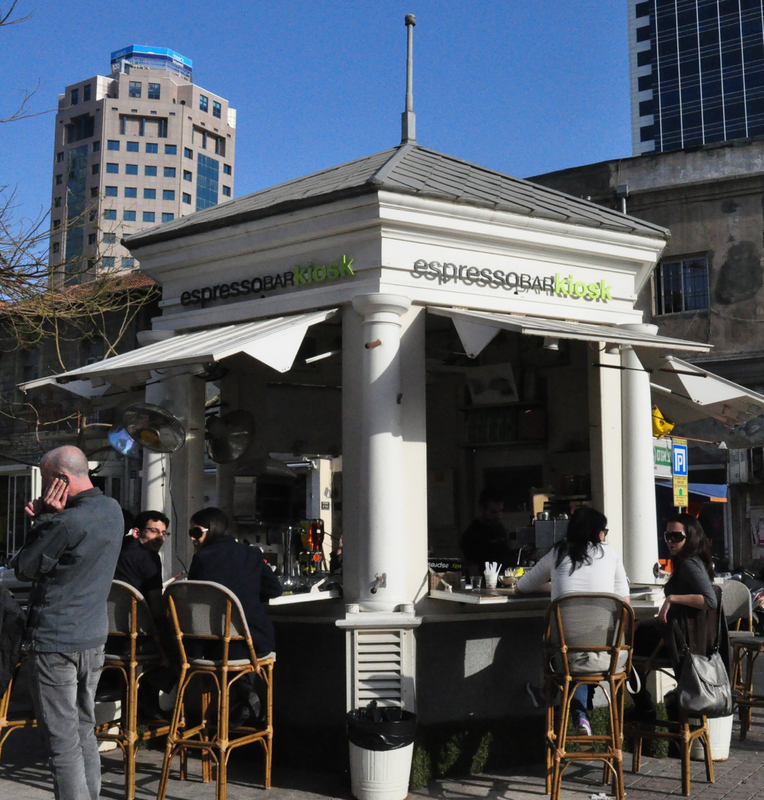 We start our tour at the corner of Rothschild and Herzl Street [another idea for a tour: the stories behind street names, the people and events important in the history of Israel] where you can savor the espresso at Tel Aviv’s first ‘kiosk’ (the second kiosk is also on Rothschild at the corner of Nahalat Binyamin; can you find the third kiosk?). 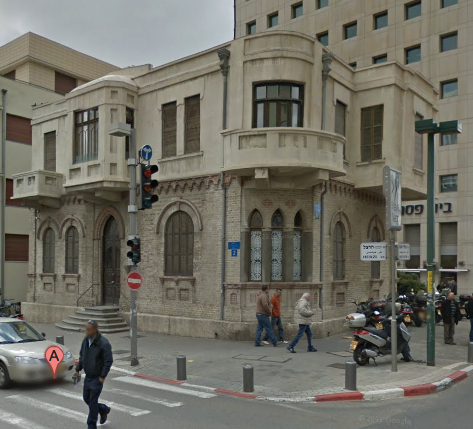 The Eliavsons, one of the 66 founding families built their house on the southwest corner of Rothschild and Herzl in 1909; in the 1930s a 4-story Bauhaus building was built there which a few years ago became the home of the Institut Français. Weiss built his house at 2 Herzl Street and at the end of the street stood the Gymnasium Herzliya until is was demolished in 1962 to make way for the Shalom Meir Tower. It seems ironic that this landmark lives on as the logo of the Society for Preservation of Israel Heritage Sites. Weiss continued with many other private initiatives — he built the first cinema (Eden) and the first post office in Tel Aviv and founded the Diamond Club which became the Israel Diamond Exchange. 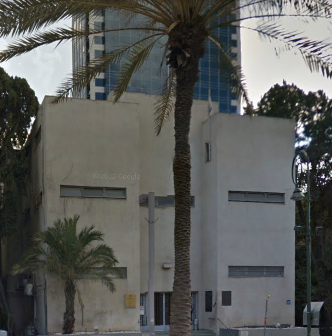 Meir and Zina Dizengoff were assigned plot 43, the precise location where the group was standing in Soskin’s photo, today 16 Rothschild Blvd. Dizengoff was the first mayor of Tel Aviv and did much to develop the city. The residence is best known as the site of the signing of Israel’s Declaration of Independence on May 14th, 1948; now it’s a museum with exhibits on the history of Tel Aviv-Jaffa. You can listen to the historic recording of Ben-Gurion declaring the State of Israel at http://www.youtube.com/watch?v=6ZDSBF5xtoo&feature=related. In 1919 Yehuda Magidovich arrived in Israel and soon became the city’s chief engineer, his office was in the first city hall in the old water tower on Rothschild Boulevard. Afterwards he became one of Israel’s most prolific architects building 500 buildings in Tel Aviv, a number of them along Rothschild Blvd. 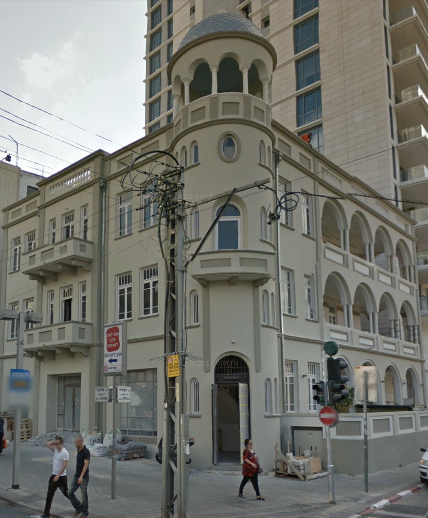 The first public building designed by Magidovich in 1921 was the first luxury hotel in Tel Aviv (called at various times the Ben Nahum Hotel and the Ginosar Pension). Today you can see the newly renovated building (on the corner of Allenby Street) with its Magidovich signature tower. Historic buildings often owe their existence to adjacent office towers, part of Tel Aviv’s preservation and development policy — the city agrees to increase the height of the building if the developer agrees to renovate and preserve a historic building in the complex. This entry was posted in Architecture, Tel Aviv and tagged heritage building, Jaffa, Neve Tzedek, Rothschild Boulevard, Tel Aviv, travel, walking tour on November 22, 2012 by Shmuel Browns. You are posting some great photo essays! Toe Dah!! (sorry about the spelling).